Unique electric toothbrush heads designed especially for kids. Provide a gentle brushing experience. Ideal size and softness for the mouths of children. Makes brushing teeth fun with Star Wars characters. Recommended for age 3+. Compatible with the entire lineup of Oral-B Stages Power Electric toothbrush, except for Oral-B sonic toothbrushes. Oral-B #1 brand used by dentists worldwide. 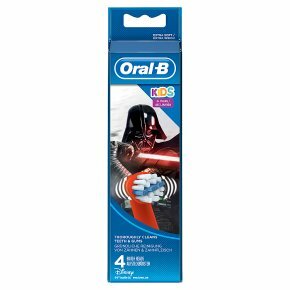 The Oral-B Stages Power Kids replacement electric toothbrush heads, featuring Disney Star Wars characters, are made for the smaller mouths of younger brushers, with a design inspired by the superior cleaning power of professional dental tools. The bristles and size are ideal for the hands and mouths of children, and each toothbrush head features Disney characters your kids will love. Each order comes with 4 x Oral-B Stages Power Kids Electric Replacement Toothbrush Heads.